A rose bush I bought many years ago was mislabeled and turned out to be a climbing rose. As I did plant it under a Bottle Brush tree, it took full advantage and made its way to the top. I had been debating on whether or not to cut it back as it is probably stressing the tree. A recent windy thunderstorm made the decision for me and knocked the long cane from the tree. I haven’t cut it back yet, as I’m enjoying the roses dripping down from the tree and the pollinators like the winter treat. A killing freeze descended on this part of the country and for the Automatic Garden, it was a blessing in disguise. I had been away from the garden quite a bit last year and many chores went undone. The Automatic Garden did what it was designed to do and kept on growing, propagating and reseeding, resulting in a interwoven tangle of plants. 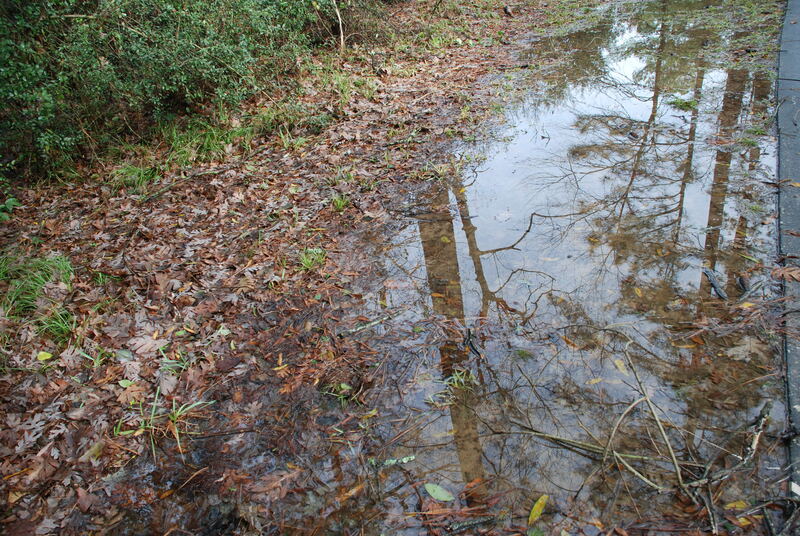 The freeze gave clarity to what needed to be pulled, transplanted and cut back. I have been spending hours everyday getting the garden in shape. Other chores included filling in a hole dug over the winter by some animal, which was probably an armadillo. It was much more work than it looks and the dirt is heavy clay. The extremely strong gingers were able to push their way through the pile of clay and the dirt had to be carefully removed. Volunteers had to be rounded up and replanted into their places in the garden. There were many, but free plants are a good thing. A scant few flowers have begun to bloom in the garden. Most years have flowers blooming all year around, but the freeze knocked back almost all of the winter flowering plants. This red canna is a welcome sight. Drimiopsis maculata unfurled its spotted leaves and sent out flowers in no time. The plant is a great substitute for hostas in the South. 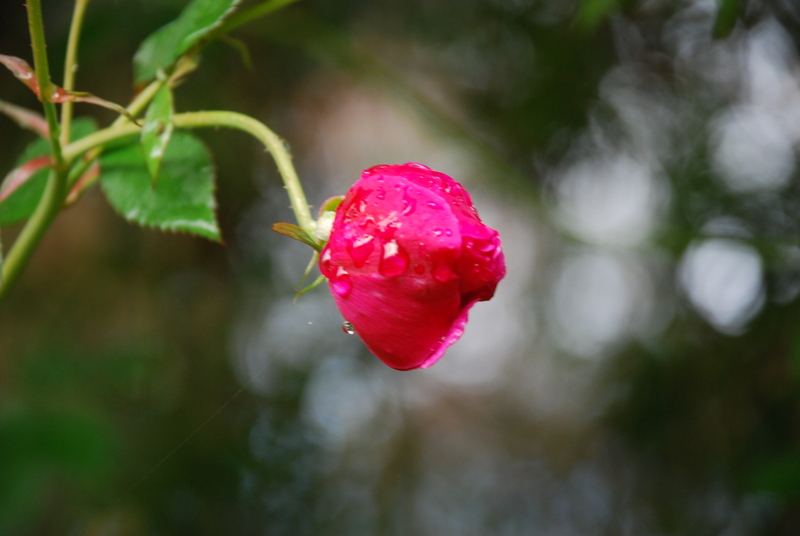 The climbing rose is blooming and dripping from a tree. Pink Flamingo Celosia usually stands three feet tall before blooming, but this one couldn’t wait. The Shrimp plant came back from its roots and the few blooms were welcomed by the Buff-bellied Hummingbird that has wintered here. The Bottlebrush has perfect timing providing food for the arriving Ruby Throated Hummers and the honey bees that are living near by. Bit by bit I am seeing my hard labor paying off and I have high hopes for a beautiful garden this summer. After being away on a trip, we returned home to see the neighbors had put up their Christmas lights. As we pulled into our drive, I caught a glimpse of glowing rose colors lighting up the front beds. It took a second to realize that we had not decorated and the landscape lights were hitting the ShiShi Camellias causing them to light up. So why decorate? Nature is providing its own Christmas display. The hollies are loaded with berries. Red climbing roses have decked out a tree. and also have formed their own round ornaments. My favorite rose Chrysler Imperial gave up a couple of years ago. It produces beautiful big flowers and smells like lemon. The original one I had met its end after 10 years of blooming. Recently, I was able to find a replacement. Another of my favorites is the China Green Rose. It has been in the garden for at least 12 years, but some of it is getting old and weak and split. Hopefully, the new canes will allow the rose to continue. 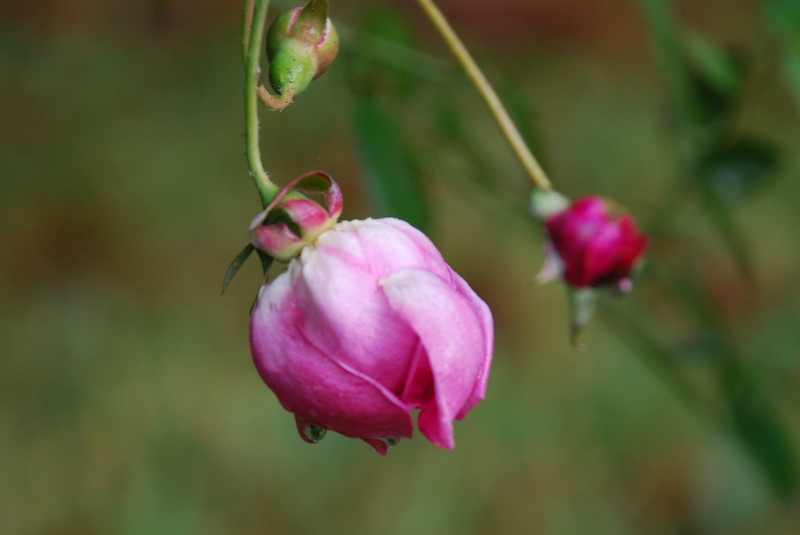 To add to the woes, several other roses have suddenly declined. They are all antique roses on their own root stock and hopefully this sprout will be a whole new rose bush. Some roses are not so lucky and even after months of waiting it doesn’t look like this poor rose is coming back. The weather has warmed up and is giving the garden a case of spring fever. These beautiful roses burst open to greet the day. 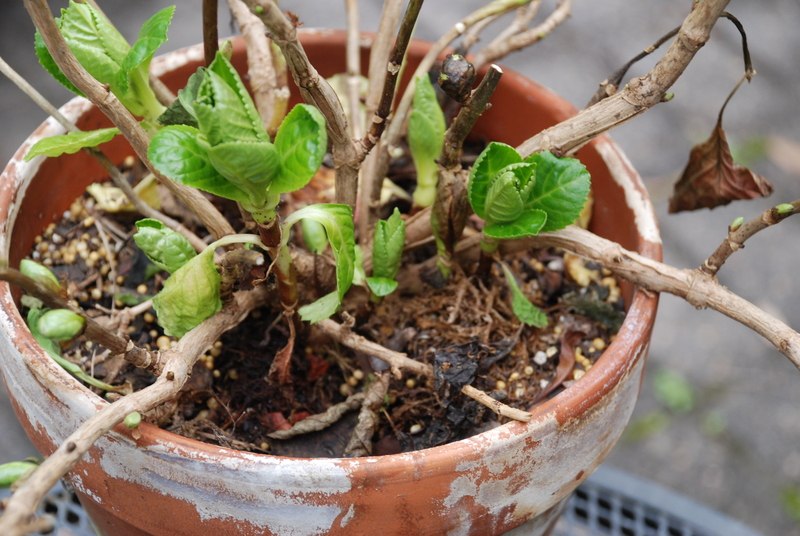 New leaves are emerging on a hydrangea. And the leaf buds on trees are swelling. Spring is just around the corner! 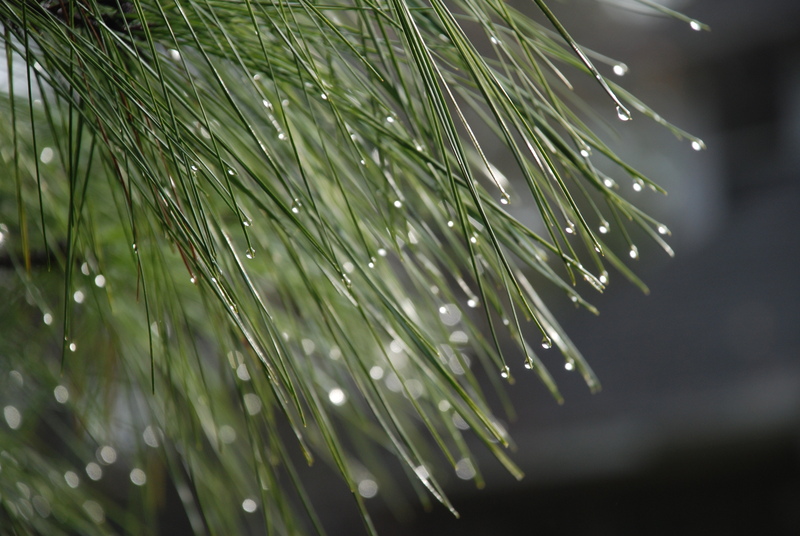 Raindrops clinging to loblolly pine needles. The rain has been heavy on the Gulf Coast these last couple of days, but no complaints here as we are facing another year of drought. Now the air is clean, the sun is out and nature is continuing her cycles.